Sweet Dreams is an independent, two-storey country house, recently renovated. It is bright and welcoming and has wooden ceilings. The house is located in a residential area on a hill overlooking a valley, with a breathtaking view of the famous Barbera and Moscato vineyards, a UNESCO World Heritage Site since 2014. On the ground floor there is an equipped kitchen, a living room, a relax area with a sofa and a bathroom with a shower. On the first floor there are two large bedrooms and a bathroom with a shower. The furniture is new, elegant and perfectly functional for a relaxing and comfortable stay. Satellite TV and free Hi-Fi are also available. Parking space, garage and garden. The house is completely available to guests and can comfortably accommodate five people. It is cool in summer and well heated during the winter months. A ten minute walk is the center of Agliano Terme, a town that gave birth to Bianca Lancia gone in marriage, very young, to the emperor of the Holy Roman Empire Frederick II. Not far away is the renowned Cantina dei Sei Castelli, in an area called "il Salere", whose name recalls its maritime origins. Restaurants and cellars of wine producers offer wine tastings and local dishes. The food and wine vocation of the area finds expression in the renowned hotel school - Professional training agency of the hills of Asti - that every year form groups of young people in the hotel tourism sector. In the village there is also a famous spa, also affiliated with national health services, for the treatment of respiratory diseases. Nearby is a well-equipped area with swimming pools and camping facilities. The area is excellent for hiking, mountain biking and horse riding. It is 15 Km from Asti, 32 Km from Alessandria, 55 Km from Turin, 66 Km from Genoa and 105 Km from Milan. Sweet Dreams is a recently renovated two-storey house. It is bright and welcoming and has wooden ceilings. Barbera and Moscato vineyards, at a UNESCO World Heritage Site since 2014. 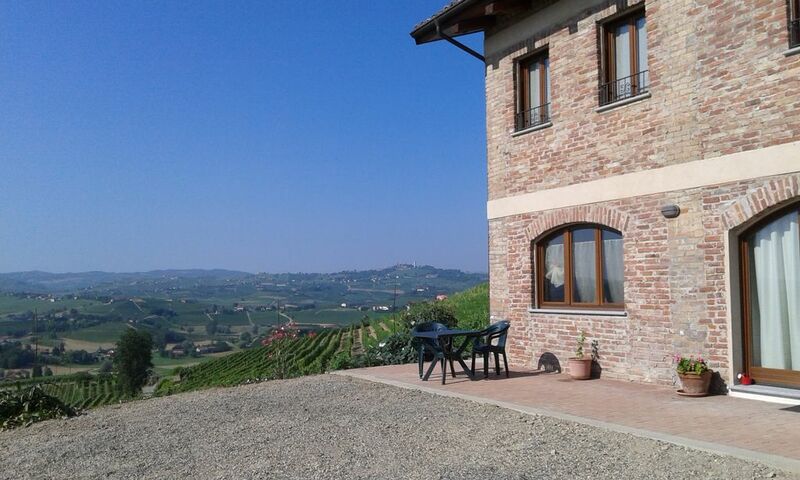 The house is located in a residential area with a breathtaking view of the famous Barbera and Moscato vineyards. On the ground floor there is an equipped kitchen, a living room, a relaxation area with a sofa and a bathroom with a shower. On the first floor, there are two large bedrooms and a bathroom with a shower. The furniture is new, elegant and perfectly functional. Satellite TV and free Hi-Fi are also available. Parking space, garage and garden. It is cool in summer and well heated during the winter months. A walk in the center of Agliano Terme, a town that gave birth to the White Lance who went in marriage, very young, to the emperor of the Holy Roman Empire Frederick II. Not far away is the renowned Cellar of the Six Castles, in an area called "the Salere", whose name recalls its maritime origins. Wine tastings and local dishes. The food and wine vocation of the area finds expression in the renowned hotel school. In the village there is also a famous spa. Nearby is a well-equipped area with swimming pools and camping facilities. The bathroom on the ground floor also has a practical and large sink cabinet for hand washing. And a small wardrobe-portascope. La casa è esattamente come ce la aspettavamo: le foto infatti rendono l’idea. I mobili sono nuovi, la casa è ben tenuta e dispone di ogni confort, a partire dalla possibilità di parcheggiare direttamente di fronte all’ingresso di casa. I proprietari sono disponibili e gentili, ci hanno accolti subito; con gentilezza ci hanno mostrato la casa e si sono resi disponibili per ogni problematica o nostra esigenza. All’interno abbiamo trovato latte, the, asciugamani puliti, shampoo e bagno schiuma a nostra disposizione. Noi eravamo in 5 e siamo rimasti per sole due notti, a Capodanno. Un peccato (il periodo) perché la vista che si gode da ogni finestra della casa è quella della vallata e delle vigne. Se ci siamo goduti la vista in questo periodo, possiamo solo immaginare come sia con tutto fiorito o con le viti cariche. Holiday Apartment Sweet Dreams is located in a charming hilly area, two Km from the town center, with a breathtaking panoramic view, whose colors vary with the seasons. The village can also be reached on foot. Along the walks you can exchange a chat with the locals, very courteous and helpful.